In this captivating performance filmed live in Tokyo’s Suntory Hall, Chinese virtuoso Yuja Wang joins the Münchner Philharmoniker under the baton of their music director Valery Gergiev for a concert featuring Brahms’s Second Piano Concerto and Mahler’s monumental First Symphony. Composed in the late 1870s and premiered with the composer himself at the piano in 1881, Brahms’s Piano Concerto No. 2 in B-flat Major experienced immediate success (in contrast to his First). The concerto reveals Brahms’s personal passion for the piano and incredible mastery of the symphonic genre, with intimate conversations between the soloist and individual instruments giving way to grandiose displays of orchestral majesty. Mahler was just 24 years old when he composed his Symphony No. 1, a work born into a world dominated by Brahmsian symphonic preeminence and Wagnerian musical unorthodoxy. Mahler’s First presented a new symphonic paradigm, one influenced by the best of both worlds. Originally conceived of as a tone poem inspired in part by a failed love affair, the work’s negative critical reception led Mahler to revise it before ultimately producing the version published in 1899. 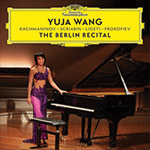 Yuja Wang appears courtesy of Deutsche Grammophon. Gustav Mahler, Symphony No. 1 in D Major, "Titan"